Ah, racing games. I’ve always enjoyed racing games, but I often lose interest after a few hours. Once you’ve taken part in a few dozen races, it kind of starts to feel repetitive. Racing games have tackled this in several ways over the years, and I think the result is a racing market which is much more niche. Most racing titles on the market nowadays cater to the fans of driving simulators, and the game’s selling point is that you really feel like you’re driving a series of cars, except you don’t need a few million dollars to enjoy the privilege. The more arcade racing games are still there, but there aren’t as many as there used to be. This, of course, means there’s a potential market for arcade racers. With Need for Speed steadily putting out racing titles of varying quality, and The Crew 2 building on the success of the first instalment, it seems like there’s some more interest in racing titles of late. The folks who design Forza Motorsports figured it wouldn’t be a bad idea to capitalize on that, I imagine. But instead of creating something that’s totally arcadey, they decided to make a racing series that was based on the core Forza games, but more focused on the arcade experience. Hence Forza Horizon. Forza Horizon 4 is the latest instalment in a series of games that have been fairly well-received. The reason for this is that the Forza games offer a nice, unique middle ground. They offer an arcade racing experience, but they still have the DNA of a racing sim. So you get to feel like you’re playing a flashy racing game like Forza, but you have more accessible controls and a simpler customization system. Speaking of flashy, Forza Horizon 4 is all about making a good first impression. The game welcomes you to the Forza Horizon festival, a fictional event billed as ‘the world’s biggest race’, with style and flair. After a brief cutscene, the word ‘Autumn’ flashes across the screen as we see the camera pan across a nice autumnal landscape, and you’re dropped right into the action and given a short race in a pretty boss sports car. Forza Horizon is simply breathtaking in its visuals, and my pc was able to run it at ultra without a hitch, so it’s also insanely optimized. In fact, optimization is the name of the game with this title. In the case of Forza Horizon 4, it was actually built with the snazzy new Xbox One X as the ‘lead’ or main console. So if you fire it up on Xbox One X, you get a choice between two modes, one called performance mode running at a fixed 1920×1080 (with a buttery 60fps) and one known as quality mode, which pushes the dial to the full 3840×2160 (4K as it’s commonly known) at 30fps. Forza Horizon 4 is just a jaw-dropper on the Xbox One X, with better motion control, and HDR of course. You can pick up the tiniest details like dirt rising or snow reacting to the weather. After the autumn sequence, you’re treated to the other three seasons, and you get a different vehicle for each. Winter sees you piloting a 4×4 through a series of snowy paths, spring puts you behind the wheel of a suped-up rally car that drifts like a sailboat, and summer puts you back in the sports car. The game very quickly introduces its wide variety of vehicles and welcomes you proudly. After that, you’re turned loose on the world of Forza Horizon, as you’re given a choice of cars (I went with the Audi coupe) and told to go make your fortune. Forza Horizon 4, like many great racing titles, bases its single-player experience around ‘career’ mode. The races are chosen via an open-world map that you drive around, so if you want to get to your next event, you’ve gotta drive there. Since you’re a scrappy young racer looking to make his (or her) mark on the world, every race allows you to build up your influence and get more points to put towards upgrades and other rewards. As I mentioned, the game’s racing controls are pretty intuitive, and I was able to get around without much bother. The car’s steering does feel kind of weighty though, so it’s closer to say GTA than it is to Burnout. However, after a while, I had gotten the hang of the handbrake system, and I was hugging corners like a pro. Forza Horizon 4 earns its arcade stripes by featuring a scoring system that prominently shows you how many points you gain by doing different actions. This can range from good actions like drifting smoothly or leading the race to bad actions like slamming into rivals or tearing up someone’s lawn with your awful driving (this action is affectionately nicknamed Landscaping). Forza Horizon 4 offers a very detailed vehicle upgrade system, and you can totally see the engine of Forza under the hood of Horizon 4 (a racing car analogy in a racing car game, what are the odds). The customization system was a little intimidating for me at first, but after a while, I got the hang of it and learned to upgrade my vehicle effectively to match my playstyle. Career mode is pretty entertaining, and you’re given a bit of investment in the story to help you plod along. My favourite races were definitely the ones that were more off-road, and as more events were unlocked, I really enjoyed having a number of options. I will say that it felt a bit harder to get upgrades later on, as the points didn’t seem to increase exponentially as I moved on throughout Forza Horizon 4. There wasn’t much grinding, but I would have been happier with a more balanced point system. 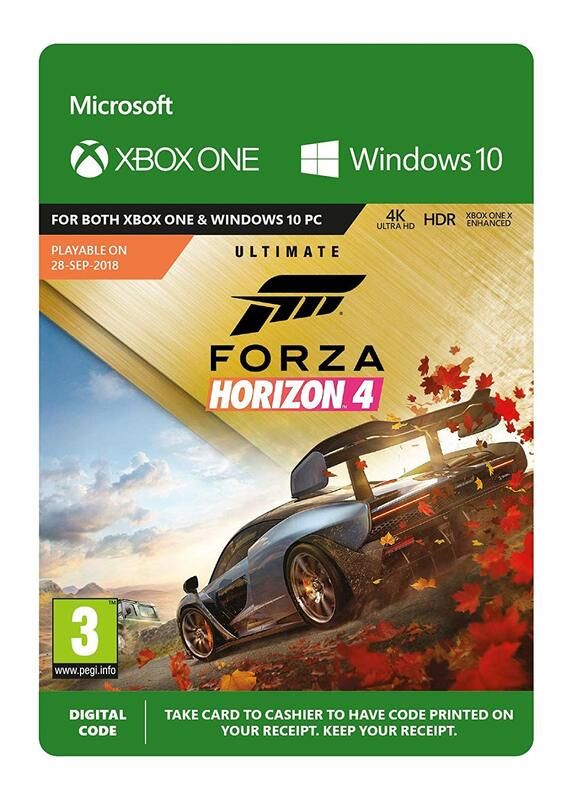 Forza Horizon 4 was reviewed using an Xbox downloadable code of the game provided by Xbox. The game was tested on both regular Xbox, Xbox One X as well as on PC thanks to the Xbox Play Anywhere feature, on a machine running Windows 10, with an 8GB NVIDIA Geforce GTX 1070 fitted on a 4th Generation Intel i7 4790 3.6Ghz CPU and topped with 16GB of RAM. We don’t discuss review scores with publishers or developers prior to the review being published (click here for more information about our review policy). Forza Horizon 4 is an excellent blend of arcade racing and racing sims, and it’s probably the best instalment of the Horizon series thus far. It offers a breathtaking open world to drive through and some very accessible racing for mainstream fans, along with a bit of tinkering for people that like their racers a bit more technical.